DISCOVER THE TOP 10 BEST OVERLOCKERS IN 2019! Welcome to OverlockerGuide.co.uk! Here you will find out all you could ever need and want to know about overlockers including – what they are, what they are used for, why you should consider buying one and our picks of some of the best overlocker machines available. So.. What Is An Overlocker? 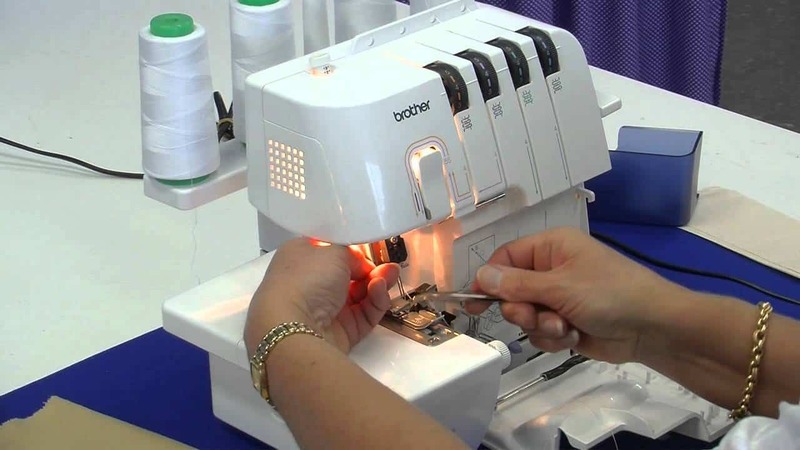 To put it in the most simplest way, an overlocker is a type of sewing machine that stitches a combination of 3, 4 or 5 threads simultaneously. Overlockers are predominately used to stop the cut edges from fraying, trim off any excess fabric and join seams all in one single operation. If you look around your home, we can guarantee that just about everything made from fabric of some description was made using an overlocker at some point in the process. The seams on the inside of a cushion cover, your blouse or shirt or even those lovely lined curtains will all feature overlocker stitches. As well as trimming edges and stopping fabric from fraying to give that professionally finished look, the design of the stitch pattern makes overlockers perfect for other applications too. Was anything you thought of when you looked around made from a stretchy fabric, such as a T-shirt for instance? The overlocker stitch pattern is designed to allow a considerable amount of stretch. This is incredibly useful when you are working with knitted fabrics like a jumper or sweater. It also makes overlockers useful when it comes to attaching elastic, and depending on the brand and model, you may also have a wide variety of different and fancy hems or edges you can finish your sewing using. Such as a rolled hem for some net curtains or a silk dress. Is An Overlock Machine Complicated To Use? The answer to this questions is yes, your overlock machine can be quite complicated to use if you have never worked with one before. However, many people (and we agree) that they are not any harder to learn how to use than a modern domestic sewing machine, especially if you are a complete newbie. Fortunately though, there are various instructional DVDs and many online tutorials and books available to help you. This is a really good question and the answer depends on whether or not you do a lot of sewing. If you don’t and only sew things on occasion, you will be better off investing in a reasonable quality domestic sewing machine. However, if you find yourself doing a lot of sewing and plan on making it more of a regular hobby or practice, you should definitely consider investing in an overlocker. 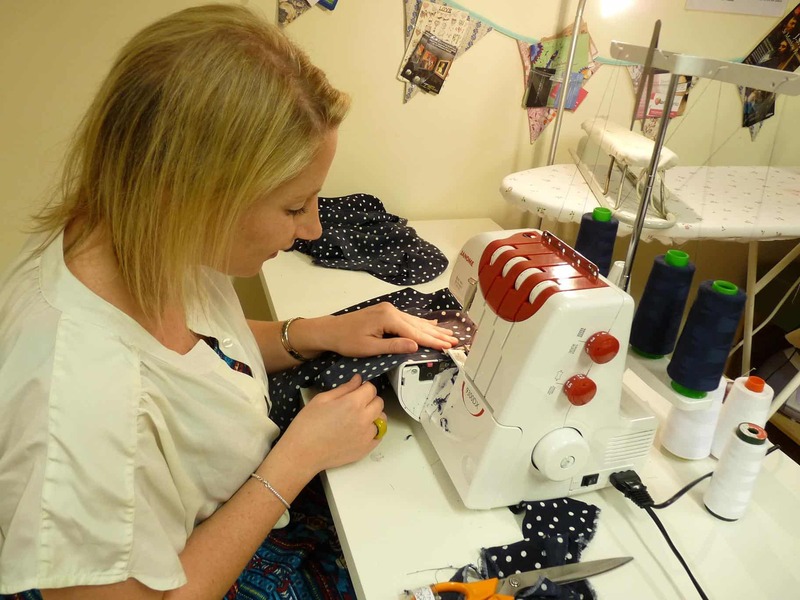 As there are many different overlocker sewing machines out there, you might find it quite a headache knowing which is the best for you to invest in. Below we have put together some of the features we think you should look out for when deciding on your overlock machine. To help you make the decision of what overlocker machine is best for you, we have highlighted five of our favourites available at the moment. We have put together mini reviews for these below and also provided links to make it easier for you to click through and buy if one takes your fancy. Be sure to check out the full reviews for many great overlocker machines that we have on this site too and make sure you stop by our buying guide to help you with the final decision. 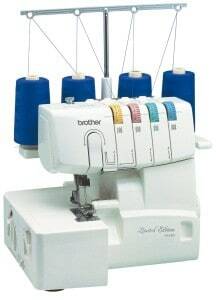 There is a reason why Brother are popular and real evidence of this is found in the Brother M1034D Overlocker, which can be used as a 3 or 4 thread machine. This overlocker will enable you to neaten, trim and edge to give all of your sewing projects that professional finish without fraying or unwind. This is ideal for beginners and features lay-in tension units, manual tension release and the easy thread left looper that makes the process of threading it even easier. 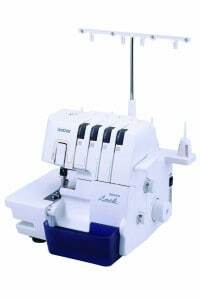 Another great machine from Brother, the 3034D overlocker allows you to overlock raw edges, trim any excess fabric and sew seams simultaneously and very easily. With this machine you can thread and cut overlock stitches using either 3 or 4 threads and there is an easy to follow thread guide and a easy threw lower looper threading system to make using this machine a breeze. 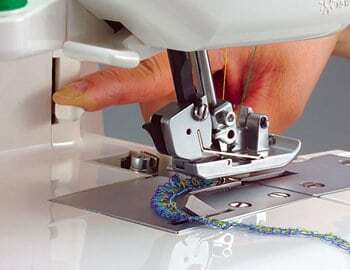 If you have used a sewing machine before, you will be familiar with the automatic tension release featured on this overlocker, as it works very similarly. You raise the foot lifter and the tension units allow the treads to simply slot into the right position. It also comes with a free arm for easier control when you are overlocking sleeves and cuffs, making more efficient use of your time and producing truly professional results. 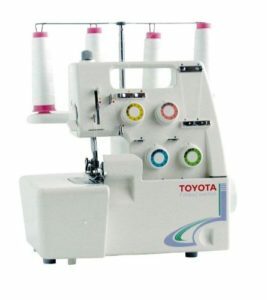 With an overlocker like this Toyota SL3304, you can save time on your sewing projects while giving them a professional finish. It will trim excess fabric, neaten and sew all in one single operation. When you use it as a 3 thread overlocker it will neaten any raw edges and seams for instance, while if you use it as a 4 thread machine it can be used to stitch the seems of any simple and soft furnishings and loose fitting clothes you may have. This machine also features a 2 step presser foot lifter which makes it easier for handling bulkier fabrics you may be working with. The presser foot pressure adjuster helps avoid costly damages to any delicate fabrics you are working with. If you are looking for a very compact, but high performing machine, you should consider the Janome 8002DX. It has a very precise stitch mechanism and a sturdy design. The machine has a built-in rolled hem feature, though it doesn’t have a plate change, to give you a professional finish to all your sewing projects. There is a cutting width that is adjustable from 2 mm to 5.7 mm. There is a differential feed to prevent stretching and puckering. The colour coded paths can be followed to make threading a breeze and there is also handy accessories such as the extra high pressure foot lifter, electronic foot control pedal and whisper quiet operation. Although the price tag for the Singer 14SH754 places it in the more affordable price range, it differs from a lot of other models in the fact that it offers more than just the minimum when it comes to sewing capabilities. 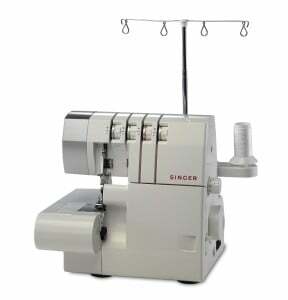 This singer overlocker machine has been designed with functionality, versatility, reliability and durability firmly in mind and it also has a number of unique features that make it stand out from the crowd. 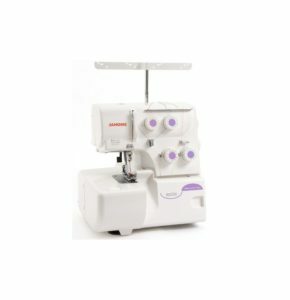 Therefore, if you are looking for a reasonably priced overlocker that offers more bang for your buck than the average model, check out the Singer Overlock 14SH754. Thank you again for visiting our website, we hope you take the time to look round the rest of the site and bookmark it for later use too. We hope it helps you find the overlocker sewing machine that is right for you. Also please let anyone else know that is interesting in finding the right overlocker for them, about this site. If you would like to comment or get in touch with us please drop us a line and we will get back in contact with you as soon as possible. We are always happy to hear from our visitors and readers.